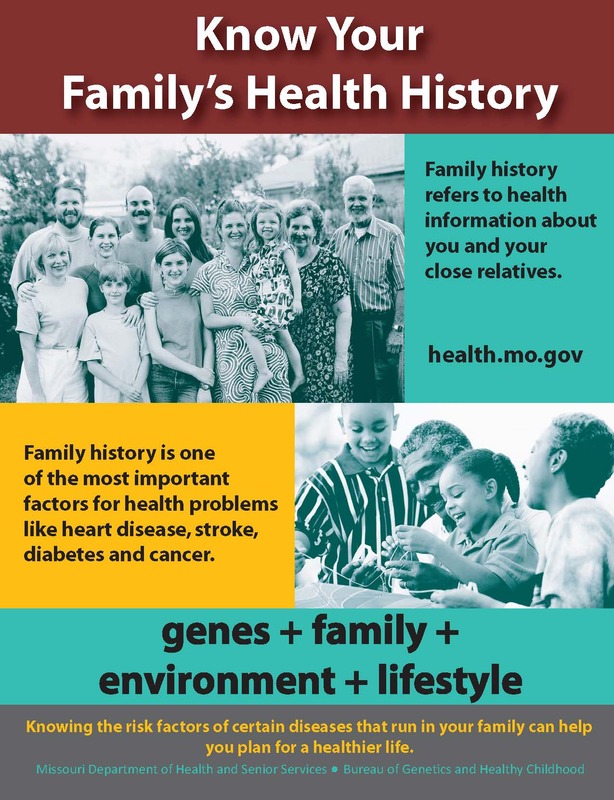 In Missouri, November is Family Health History Month, a good time for all Missourians to learn more about the diseases and causes of death affecting at least three generations of family members. Family gatherings, such as holidays, are a great time to catch up on family news and information. They can also provide a good opportunity to learn about your family's health history. Mapping your family's medical history and creating a medical family tree can help you identify some health risks you may face in the years ahead and help you plan for them. In 2004, U.S. Surgeon General Carmona declared Thanksgiving Day, when American families traditionally gather together to celebrate and give thanks, to be the first annual National Family History Day. Americans are encouraged to use their family gatherings as a time to collect important family health history information that can benefit all family members. The Healthstyles 2004 survey, conducted in August by the U.S. Centers for Disease Control and Prevention (CDC) found that 96 percent of Americans believe that knowing a family history is important to their health. The survey also showed that only one-third of Americans have ever tried to gather and organize their families' health history. This information can help health care providers do a better job of assessing a patient's risk of disease and prescribe appropriate preventive measures or courses of treatment. Family health histories should be provided to all health care providers to be retained as a permanent part of a patient's medical file. Family history is considered one of the most important risk factors for health problems such as heart disease, stroke, diabetes, cancer and certain psychiatric disorders. Family members share more than genetic characteristics. They also share environments, lifestyles and personal habits. All can be factors for disease. Knowing you are at risk for certain diseases can motivate you to change any unhealthy behaviors. For additional information about family history click on the links below. American Medical Association, "Family History Tools"
Centers for Disease Control and Prevention, "General Public: Family History"
National Society of Genetic Counselors, "Your Family History - Your Future"
United States Department of Health and Human Services, "U.S. Surgeon General's Family History Initiative"
March of Dimes "Family History Form"
Genetic Alliance "Family Health History"